Other results will soon follow... I am already feeling better :) Amazing what positive thoughts and determination will do! Yes, it has finally got a hold of me, sunk it sharp teeth deep into my soul. Between my frustration at my body (the pain from my sacrum & the loss of my workouts and declined activity due to the pain), the loss of my Mom, and life in general, I have fallen into the darkness of depression. I have no interest in much of anything. I am however recognizing the depression and seeking help in the form of herb tinctures: Motherwort for my anxiety and heart palpitations, and currently looking for St. John's Wort in tincture form. It was brought to my attention that St. John's in capsule form is not the best way to go and if I want good results, to do a tincture. I am hitting my local health store Friday, in hopes they have some. If worse comes to worse I will have to order online. Motherwort aids in treating hot flashes, stress, heart palpitations, night sweats, and anxiety. 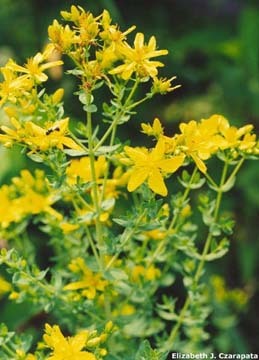 It's traditionally used as a tea but can be used in tincture or capsule form. I got my tincture from my friend Christine at Christine's Natural Creations. Another great place to get herbs is my friend Sheila; you can find her products at Envizionz. Sheila has some awesome teas, as well as herbal capsules, ointments, etc.To keep it fair, I think I will enlist in Sheila's help for the St. John's if I can't find it local. So although I may have succumbed... for the time being, I won't stay down for long. I have a life long history of battling depression, and I always come out of it... eventually. It's been a long time though, that I have been this bad. I am tired of fighting and for the moment I'm wallowing in it, but as soon as I get my St. John's I will rejoin the battle. I woke up to snow, began my normal morning routine, then went outside to warm up the truck, returning to the warmth of the house to wait. A bit later I return to the truck prepared to drive to work only to find out that the damn thing automatically locked. So here I am standing in the snow, the truck us running, but I'm locked out...with no spare key. Disgusted, I make my way back towards the house and... fall, jarring my bad back and hurting my bad knee. Once inside I call work to explain to my boss why I was going to be late, then I phoned the police. The police informed me they could not help and instructed me to call a locksmith. So I call some locksmiths, but due to it being so early in the morning nobody is answering their phones, go figure. By this point I'm on the verge of crying and call my Uncle who tells me to call the Fire Department. Sooooo I call the Fire Department and guess what, no one answers the phone. So I call my Uncle back and he told me to call a certain tow company and instructed me to tell the guy that he told me to call. So I call the towing company, and finally, someone answers AND is able to help. Yaaay! It only cost me $50, but hey, I was just happy to have the door unlocked and able to get to work. So on my way to work, someone takes a corner and sliiiiides towards me, missing me by inches, to sliiiide right in front of me, passing me, and sliding into the other lane, pretty as you please! No worries, nobody was hurt. He/she was able to correct the vehicle without further incident. I get to work and I'm sitting at my desk when a spider decides to visit, almost falling in my lap. Now, if you know me, you know I don't do spiders. Nope, nuh uh, no way! Somehow I managed to scoot away without squealing while Spider scurried happily away. My back is currently giving me the-what-for, but my knee isn't too bad....so far. I think today would have been better spent at home in bed. "A single footstep will not make a path on the earth, so a single thought will not make a pathway in the mind. To make a deep physical path, we walk again and again. To make a deep mental path, we must think over and over the kind of thoughts we wish to dominate our lives." It's been awhile since I've done a post about a stone or crystal, so tonight I thought I'd write about another of my favorite crystals, fluorite. I hope I haven't written about this crystal before; I review my other blog entries but didn't find a previous post... unless I over looked it? Fluorite is a calcium fluoride crystal and can be found in a variety of colors from colorless, white, yellow, red, pink, black, and my favorite, the combination of purple and green. Isn't it gorgeous? Spiritually, fluorite aids in bringing focus, structure, insights and/or visions, strengthening one's ability to receive psychic information, and the ability to interpret the information received, as well as clearing energies... great for meditation. 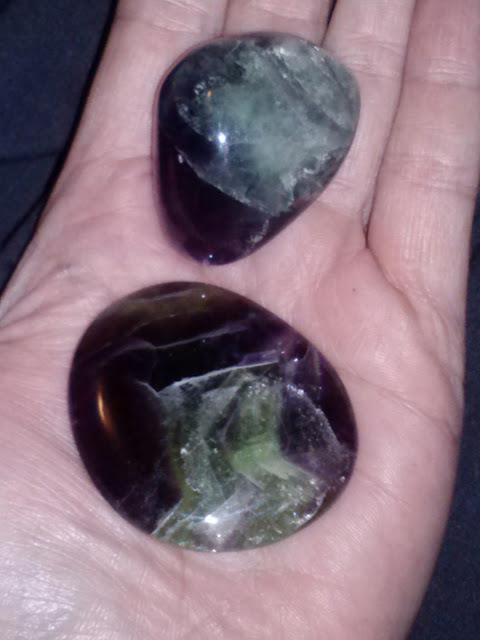 Emotionally, fluorite assists in clearing up confusion, instability, dishonesty, and fear. Physically, fluorite aids in ailments such as imbalances of brain chemistry, brain stimulation, dizziness, vertigo, strengthening bones and teeth, and assists in the ability to learn and retain information; it makes an excellent tool for studying. After the death of a loved one, life still goes on. I have not allowed myself any other option, but to keep moving forward. I will not allow myself to sink into despair. I have to keep going for myself, and for my family, and as the executor of Mom's estate, there are things that must be dealt with; I think this responsibility has somewhat helped me in moving forward. I have listed my progress in steps. I don't know why, maybe it will help someone else or maybe just give me something to look back on someday. The first things I did were make cremation arrangements (no service per her request), cancel her credit cards and cell phone in the midst of packing up Mom's belongings and helping my sister move out of the two bedroom apartment she shared with Mom into a one bedroom apartment, dividing Mom's personal items between the two of us and bagging/boxing clothes and items for donation, and going through her bills and files looking for life insurance (which she had none of), etc, and having an appointment with Mom's attorney about questions we had about bills, Mom's bank account, filing taxes, and Mom's Ford Explorer. When appointed as the executor of your loved one's estate, I highly recommend speaking with an attorney to at least guide you in what you need to do and help you with any questions that you may have; it helped me and gave me some peace of mind. Once I received her death certificates, I had to wait 30 days after the date of her passing (January 19) before closing her bank account and changing Mom's truck over to my name; however the attorney instructed us to do these things together because we were both named in her Will. Now that the one month anniversary has come and gone, the ball is rolling again. Last Friday Deb came up and we were able to close the bank account, but DMV was closed, much to our frustration. Today I went to DMV alone (Deb couldn't make it up this week) and switched over the title of the Explorer into my name. Mom had gifted it to me years ago but never signed over the title; now that's done, along with registration and a new license plate. Once I finished with DMV I went to Mom's insurance provider, closed her account, got auto insurance for myself, and while I was there I also got life insurance and rental insurance. I cried while at DMV sitting there filling out forms, I realized today is February 1st and Mom's birthday is in 14 days. The clerk helping me was very kind and compassionate. She told me "Just let it out Honey, you will feel better." Bless her! I almost began crying again at the insurance company and had to fight back tears. I'm still crying off and on. All of Mom's bills are still being mailed to Deb's apartment. The next step is to get those bills from Deb and begin the process of mailing out death certificates, copies of the statement from her attorney stating that Mom passed away with only two grand in her bank account, and had no other assets; this should save us from a probate. As for any debts owed, the attorney said I am not responsible for paying Mom's bills; bill collectors cannot collect from me, which is a relief being that I'm not in the position to pay her debts; the very idea was stressing me out! 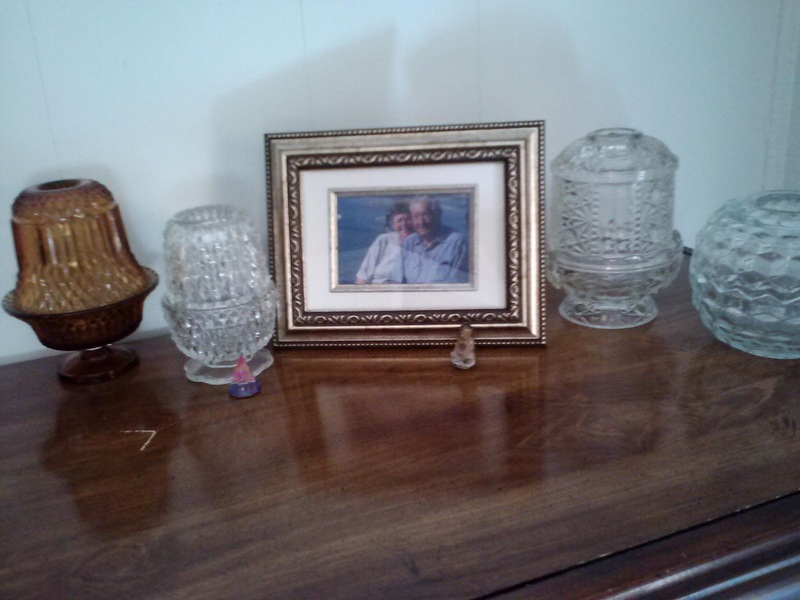 I am now in possession of Mom and Dad's chest of drawers, and it is now an altar in their memory; it's a work in progress (below).The photo is of Mom and Dad at Morro Bay. The fairy lamps are Mom's, except for the amber one which I purchased at a local antique store this afternoon. Sitting in front of the photo is Mom's little Buddha that I remember her having since I was 9 years old, and that little triangle shape sitting beside the front fairy lamp, is one of Mom's crystals, an Austrian crystal. I have more of Mom's crystals, but they are the hanging type. I'm currently trying to figure out how to display them above the dresser... maybe a small clothing hook rail. 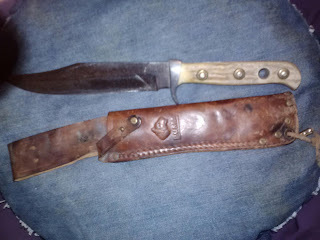 The only thing of my Dad's that I have is his hunting knife; it has his initials on the blade. I'm thinking of displaying that somehow, but being as it is in a leather sheath, I'm uncertain as to how. Maybe I will tuck the sheath aside and only display the knife. Next on the list is releasing Mom and Dad's ashes. The Mortuary was kind enough to mix their ashes together for us, so now we just have to save the money for a trip to California. Mom and Dad wanted their ashes mixed together and released into Morro Bay, their favorite vacation spot. They would try to go there every couple of years, just the two of them. I researched the local hotels and estimated that it will cost us around one grand for four days. It will be a family trip when we go and we will require 2-3 rooms for myself, my sister, my younger son, and my older son and family (wife, and 3 kids). This trip and will require 1-3 years (or more) of all of all of us saving up the money before we can perform their last wish. I'm thinking a savings jar is in order!